5 Bedroom, 3 Bathroom With Walkout Basement! Come and enjoy yourself in our beautifully remodeled lake home. This 5 bedroom 3 full bathroom home has plenty of room to sleep 14-16 people. There is also room to put blow up mattresses on the floor. There is a sandy beach for kids to play. The bottom of the lake has a gradual slope that is all sand, and great for swimming. 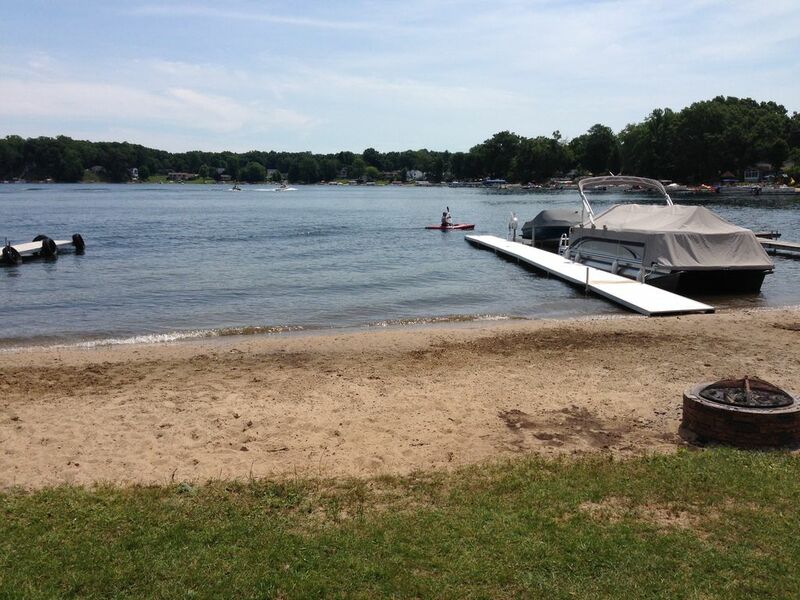 Little Crooked Lake is a 105 acre lake that is all sports. So bring your boats, skis, and swimming suits to have a great time on this little gem of a lake!! My name is John Paliga, I grew up in the south suburbs of Chicago Il. I am now a Firefighter/Paramedic in the Northwest suburbs. I have a beautiful wife with 2 amazing kids. My Dad and I bought this house to enjoy with our families. As a kid, we would go up to Sister Lakes and spend the weekend at my parents friends home on Round Lake. It was so much fun, that I would leave there every time wanting to come back. It is the ideal place to spend a family vacation, and very close to home for a quick weekend getaway! Sitting out on the huge wrap around deck in the morning drinking coffee and watching the sunrise across the lake! Also, being on the West side of the lake puts the deck in full sun during the day, and full shade at the end of the day so you can eat dinner outside! The walk out basement has a bathroom down there to easily accommodate bathroom breaks so you don't have to walk all the way upstairs. We have 2 refrigerators. 1 in the main kitchen, and a spare downstairs for extra food storage. Fully stocked kitchen with pots, pans, silverware, utensils, blender, etc. Everything was great from the moment we got there. The place was exactly as it was described. So much space and everything you need for a great stay. Owner is very fast at replying to any questions or concerns. Great house on a small lake. Plenty of room for a big group. Nice clean house & lots of amenities. Went for my daughters bachelorette party. 13 of us had plenty of room to stay and get ready to go out to several wineries on Saturday. Would highly recommend this house. The house was extremely clean. Very roomy - we had a mini family reunion and there was plenty of room for everyone. The lake is lovely! The kitchen was very well stocked with all the pots, pans, dishes and glasses we could have ever wanted. Overall, an excellent stay. A large house that exceeded our expectations. The house is well stocked and the extra refrigerator downstairs was a real bonus. This is a perfect house for a family vacation. We had 6 adults and 5 children in our group. Great fishing and swimming in the clear lake with a sandy bottom. Our grandkids loved the “water mat” and there are lots of outside chairs. John the owner was fantastic! He was always ready to answer our questions and ensure we had everything needed to make it the perfect family vacation. We are going back next year! We chose this house from the website for a few specific reasons, and it did not disappoint. Lovely house was comfortable and clean with enough room for everyone. It even has central air and wifi. Since we have young grandchildren I wanted a sandy beach area where you wade into the water, and the kids had a blast. The house was equipped with many items that we've had to drag with us at past rentals, i.e. Bed sheets, bath and beach towels, kitchen utensils and baking dishes, box fans. Basically you bring your clothes, food and beverages and you're good to go. My family of 10 adults and 5 kids stayed here for Thanksgiving. We get together only once every two years, so it is very important to all of us. The house was beautiful, and large enough for everyone to sleep comfortably. The huge (and well-stocked!) open kitchen made meal prep easy, and we were all able to dine together. Two large living rooms were great for kids and adults to enjoy their own movies. We enjoyed playing games altogether, and sitting around the fire pit. Host was welcoming and easy to reach throughout the stay. I had a lot of people to please in the family, and everyone was thrilled with the place. We hope to come again for our next stay, or even earlier. We would LOVE to come back sometime during the summer to go swimming and fishing. Thank you! I’m so glad everything worked out for your holiday get together! You guys were a pleasure to talk with! Thank you again! I only rent out full weeks from Memorial Day through Labor Day. My weekly rentals run from Friday-Friday. My weekend rate is $350 per night with a minimum of 2 night stay. That price runs from after Labor Day through Memorial Day. Thank you.